After suffering with yet another wet English winter, the sight of a newly emerging hyacinth flower is enough to warm the hardest of hearts. Their richly fragrant scent combined with striking Mediterranean colours not only puts other spring flowering bulbs to shame, but it makes it one of the true wonders of spring. These stunning bulbs are believed to have been first brought into cultivation by the ancient Greeks. 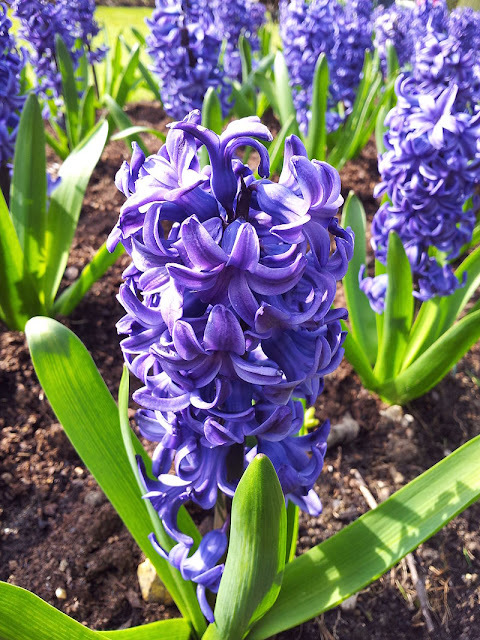 In fact the word hyacinth originates from the word ‘Hyakinthos’. In ancient Greek mythology, this was the name of a handsome young Spartan prince who was loved by the gods Apollo and Zephyrus. Highly valued for it scent it became an instant hit during the ‘Tulip mania’ period of 17th century Europe. Desired by rich merchants and aristocrats alike, owning unusual and spectacular flowered bulb became the fashionable way of showing off their wealth and status. Understandably, during this time they became exorbitantly expensive and eventually becoming available to only the wealthiest of flower collectors. Over the next century over 2000 cultivars were developed from which our modern varieties are descended although they now command a far more reasonable price. Enter your local bulb retailer during the autumn months and you will find a selection of loose and pre-packed hyacinth bulbs, but be careful what you choose as they will be available in two distinct conditions. Those that have been ‘prepared’ and are suitable for indoor flowering and those which have not been prepared and therefore better suited for planting outdoors as spring flowering bulbs. 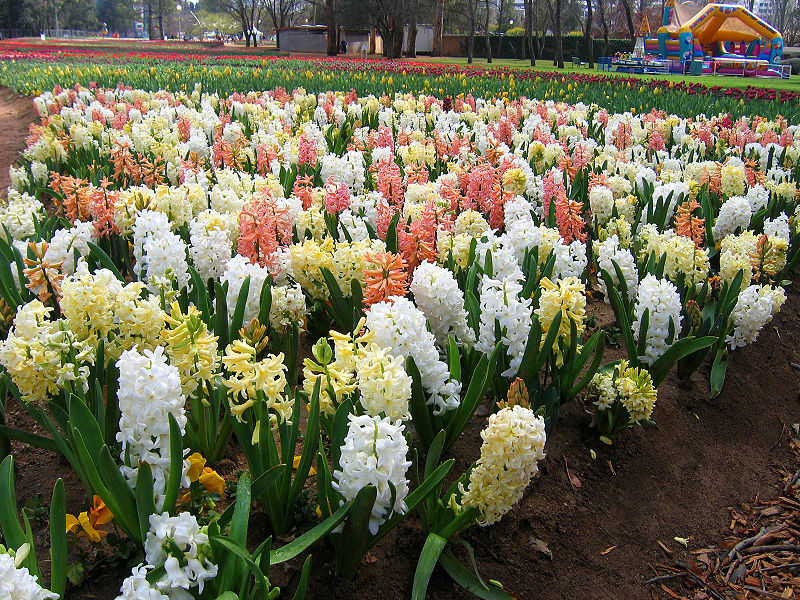 Prepared hyacinth bulbs are special because they have undergone a sequence of cold temperature treatments used to encourage flower initiation. 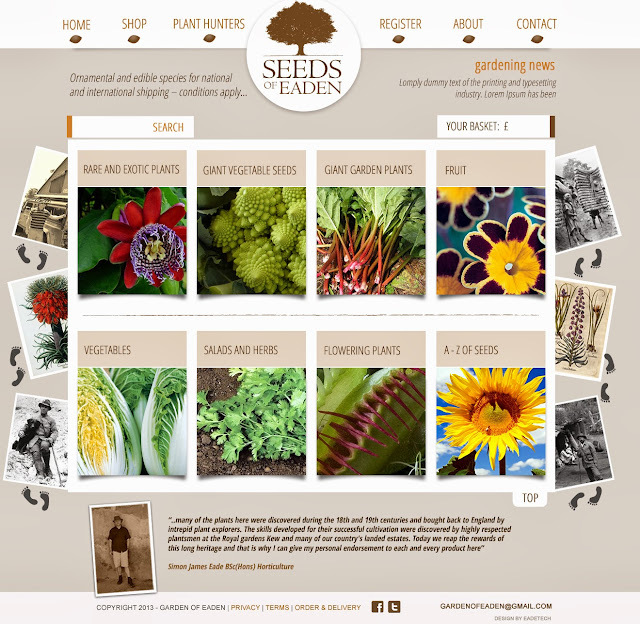 If they are planted indoors by the end of October then they should be flowering in time for Christmas. Native to the dry regions of the Middle East, drainage is one of the most important considerations when planting these bulbs so make sure that there is plenty of grit at the bottom of your pot or planter before you add your compost. Place your bulb with the flattened end facing downwards then backfill with either standard bulb compost or something free-draining like John Innes seed compost. Even then, it can still help to add a little more grit, perlite or vermiculite to ensure suitable drainage, reducing the threat of fungal rots. If you are planting into traditional bowls you will need to space you bulbs approximately 1 inch apart, but remember to wear gloves if you have sensitive skin as you may find the dry sap residue irritating to your skin. In extreme cases, even the slightest contact can cause your skin to turn red, blotch and very itchy. 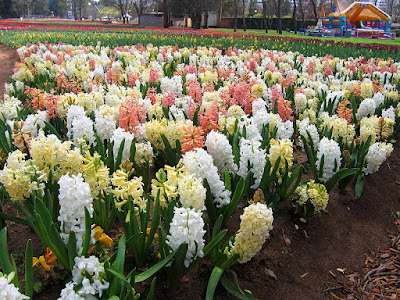 As a rule, different hyacinth bulb colours will flower at different times and so it generally best to keep the same varieties to each container. Plant them with the nose of the bulb sitting above the soil level by about an inch, then top off the compost with a layer of gravel of decorative grit to act as a drying mulch. Move your finished container to either a cool shed or leave outside with a weighted bucket over the top in order to exclude light and damage from pests like squirrels. After a couple of months, fat buds will begin to appear and at this point they would need to be brought back inside to a cool bright room, near a windowsill. They should reach full bloom in just three weeks time! For untreated hyacinth bulbs it's best to plant them outside, in a sunny site and preferably into a free-draining soil. You may wish to mix in a good bulb fertilizer first, but if your soil is acidic, you can add a little lime. Plant them between 5 and 6 inches in depth and approximately 5 inches apart. Avoid areas that are too damp as these bulbs can be susceptible to rotting. You will find that Hyacinth bulbs are self propagating producing smaller bulbs at the bottom of your parent plants. These can be removed and replanted every year to maintain your displays. Once the flower has finished, you can remove the stems, but you may wish to leave the foliage, allowing the bulb to absorb the nutrients providing a stronger display next years. Main image credit - Elena Schifirnet licensed under the Creative Commons Attribution-Share Alike 3.0 Unported license.